Ragdoll cat breed information, advice about Ragdoll cats. Ragdoll cat breed information, advice about Ragdoll cats. Ragdolls are stunning to look at, and known for their wonderful temperaments. The rather beautiful Ragdoll is the second most popular breed registered with the Governing Council of the Cat Fancy (GCCF) and ranks even higher with owners! 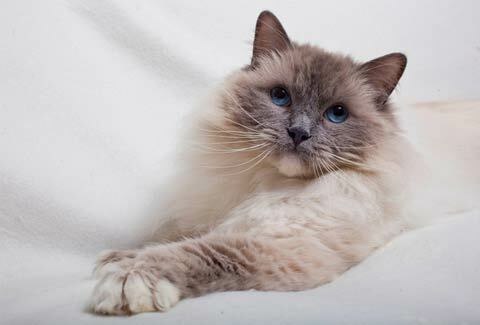 For many, the Ragdoll has it all: big blue eyes, a sweet face, silky coat and heart-melting soul. In return for his loyalty, the only thing the Ragdoll asks is to be part of your world. They love to be around people and with their unique 'smiley' expression they are so easy to be with. The more love and attention you give to a Raggie, as they are affectionately known, the more love and attention you get back. Underneath the semi-longhaired coats and distinctive markings, there's a cat of substance with a muscular body. Large and playful they may be, but Ragdolls are well-known for their easygoing, 'that's life' attitude. For this reason Ragdolls are usually kept as indoor cats and not let out unless under strict supervision. Ragdolls may be many things, but they're not street savvy! A sensitive breed, Ragdolls will suffer if left alone for long periods on their own and if they are not kept entertained. When it comes to coat care, Ragdolls need a brush a couple of times a week, particularly under the legs, to prevent their coats from matting. Ragdolls usually like to be groomed and, as with many of the longer-coated breeds, tend to look their best in the winter with their fluffy ruffs and knickerbockers. Breeder Roz Hamilton of Phatpaws Ragdolls in Bedfordshire, says: "The Ragdoll is known for his laid-back, floppy attitude. However, they are extremely tenacious. They may be laid-back but not to the point that they're not clever. They're very intelligent and are quick to work things out. Ragdolls like to be amused and crave routine. They seek out human companionship at every opportunity and will never be far from your side." Although it is considered a popular misconception that Ragdolls were so named because they go completely limp (Ragdoll-like) when picked up, Roz says the majority of her cats do indeed go floppy when handled: "I believe that this 'floppiness' is a result of the Ragdoll nature, rather than frame or composition," explains Roz. "I think the floppiness is a result of complete trust and relaxation when being held." Linda Moore, honorary secretary of the Progressive Ragdoll Breed Cat Club, says: "They're extremely good with children too and react exceptionally well to them. They can sense personalities and boisterousness, and will play with them in different ways based on that. I have never, ever known a Ragdoll to scratch a child - they work out what to expect and retreat away if needed." The intelligence doesn't stop there: with the right training, Ragdolls can learn a whole list of 'party tricks', from recall to 'roll over' - you may even enjoy a few rounds of fetch! The Ragdoll's history is brimming with myths and half-truths, but it is known that they were first bred in the early 1960s by Ann Baker in California, USA. Ann mated white Angora-like Josephine with the cat's sons by different sires, Birman-like Daddy Warbucks and Persian-like Blackie. Daddy Warbucks later mated with the daughters of these pairings, Buckwheat and Fugianna, and the Ragdoll breed began. Ann created a breeding programme with franchises, but her eccentricity led others to break away and develop the breed alone; Denny and Laura Dayton were amongst those who helped get Ragdolls recognised in the USA. Ragdolls were imported to the UK by Pat Brownsell and Lulu Rowley in 1981, and the breed was recognised by the GCCF nine years later. As John Harrison, PRBCC's vice president and show judge of 25 years, explains, there isn't a massive range of choice of colours or patterns with the semi-longhaired Ragdolls - although he cites this as proof of the breed's popularity as a pet and "not just a pretty cat". Ragdolls are available in seal, blue, chocolate, lilac, red and cream, in either colourpoint, mitted or bi-colour patterns, with tabby and tortoiseshell options. John says: "The standard is very specific about where the white can be. Good breeders have got it down to a fine art!" He adds: "There's nothing wimpy about them; you want strong, hefty cats. They have strong-boned legs, a flat head, good width between the ears, big cheeks, a shortish nose with a curving profile, and blue eyes. They must have a short neck and a long body - it sounds a bit odd but that's what the good ones are like!" Ragdoll cats, along with some other breeds, have been known to suffer from Hypertrophic cardiomyopathy (HCM) - an hereditary heart defect - and polycystic kidney disease (PKD), although the latter is rare in Ragdolls in the UK. Potential kitten owners are advised to check with breeders that both parents have tested negative for the HCM. Ask to see a certificate or test result for confirmation. A Ragdoll kitten will cost around £500-plus and should be full of life. He will relax as he matures. Make sure the kittens were born and brought up indoors because this should mean they have been well socialized and have a good temperament. A Ragdoll's true coat colour does not develop until he is around 13 weeks old. Ragdolls are ideal for the majority of households, from elderly owners to young families, single people to dog lovers, but it's still important to consider their need for companionship before you welcome one into your home. "It's not ideal for them to be the only pet in the house, especially if you're out at work all day," says Linda. "They do need some sort of companion. They're quite laid-back though and will happily settle with any animal." Ragdolls are happy to live as indoor-only pets, but if you can let them out, try to cat-proof your garden as this breed isn't very road-savvy. Most importantly, Linda adds: "Do your homework before you get a Ragdoll - they may look beautiful but looks aren't everything!" Rachel Mansel was looking for the perfect family cat - instead, she found two! "I have known about the Ragdoll breed for some years; a friend adopted one and I instantly fell in love. Growing up as a child we were always a cat household and I had never been without one until I was living in Germany, as my husband is in the armed forces and we were stationed there. In the year before moving back to the UK, I did lots of research on the Ragdoll breed and decided they would be perfect for our family, especially our young daughter, Lottie. "We were so excited after picking up our male seal-point Figaro. In the few weeks that passed, we had lots of contact with the breeder and decided that we would also home Figaro's blue-point brother, Midge - so once again we went to Linda and collected addition number two! They settled in well together after a day or two and we cannot imagine our lives without our boys... they are definitely lords of the manor! "Our Ragdolls are now almost one year old and therefore full of mischief. I always thought I would only have the one but it's true what they say: Ragdolls love company and having two boys was definitely the right decision for us. We adore our boys, as does four-year-old Lottie. They are the most placid, friendly yet highly intelligent breed I have ever come across. Figaro will play fetch, bring his toy back to you and drop it at your feet to throw again; Midge is able to put his paws up on the drawer full of treats, lean back and pull the drawer open, so we have come home once or twice to find them tucking into their treats! "They are the perfect companions and complete our family. Our boys are Lottie's best friends: wherever she is, they are, whether it be laying colouring, reading them stories, playing doctors and vets with them or playing hide and seek or chase! I don't think I have ever seen cats with such human-like traits. "I am definitely a Ragdoll convert and would never have any other breed. They are the most strikingly beautiful and genuinely loving breed I have come across and I have recommended them to many cat-loving friends. The advice I would give is that if you are out of the house a lot, definitely consider a pair of Ragdolls: double the love! They are the best companions you could ever wish for, and yes, they do moult, but a good brush once or twice a week and good-quality nail clippers is all you'll need. If you are reading this and thinking about getting a Ragdoll then go for it... it will be the best decision you have ever made!"